Its been a year in the world of fashion blogging and now just one glance is enough for me to decide if I like what I see and if I really want to wear it. As described in my previous post Bridal gold jewelry at ManuBhai, I was wearing 22k gold antique jewelry so I wanted an outfit which is equally elegant to match it. The Lehenga I wore with the jewelry was a match made in heaven. 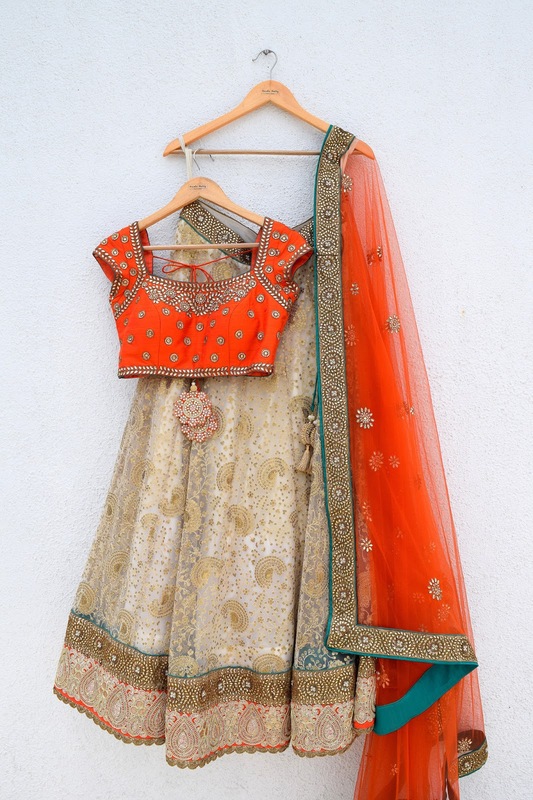 This heavy sequenced lehenga(skirt) is made by the celebrity designer Anisha Shetty. The moment I saw it online I knew I wanted to wear this atleast once. I had sent her my measurements in advance so when I first tried the lehenga it was perfectly fitted. I am not sure if these pictures do justice to the details but the lehenga has beautiful sequenced work on it. The kundan work is neatly done and in right quantity so totally a silhouette you would wear on special occasions. 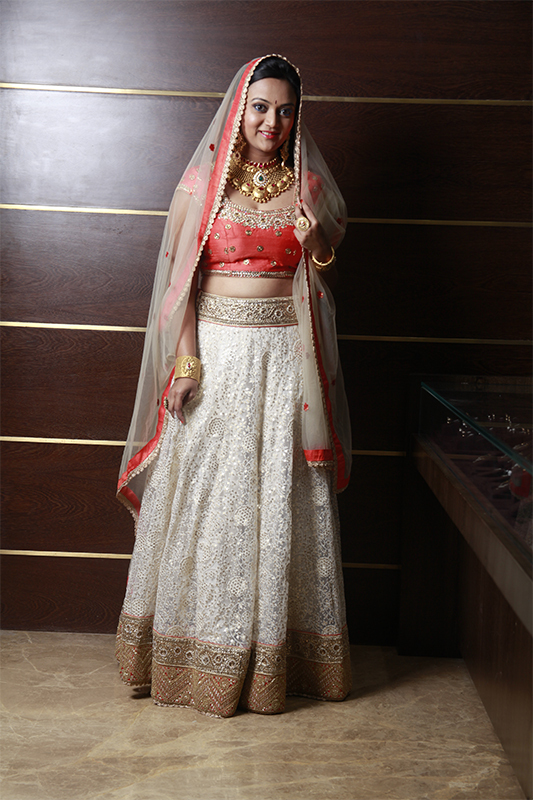 The lehenga is fitted to the waist and gradually extends outside forming a full circle. Its layered inside so it gives the lehenga full volume and lets you stand gracefully in it. You could check her collection on her Instagram page here ! The raw silk orange top is a perfect color for festive and special occasions. The overall color combination suits perfectly on the indian skin tone. 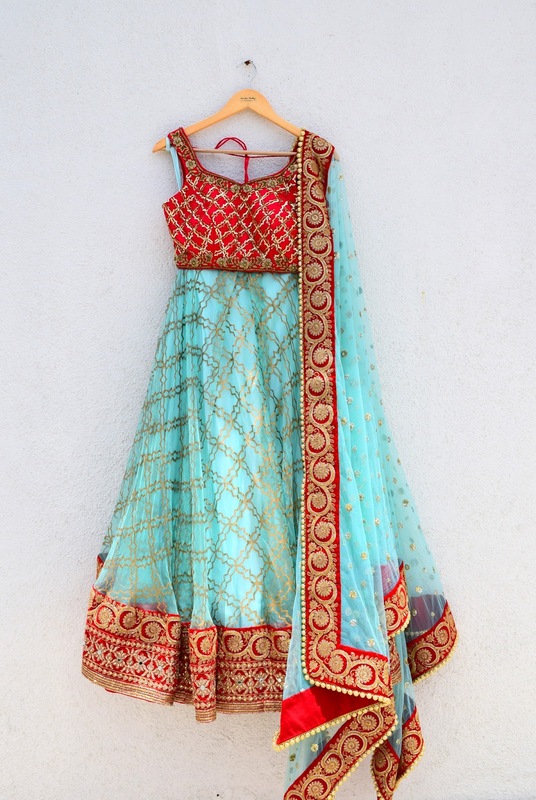 Sometimes there are Lehengas which are completely sequenced or embroidered with loud colors and patterns. Such Lehengas can only be lightly accessorized else you end up looking like a christmas tree. But during weddings, we all want to flaunt our best jewelry so I would suggest such Lehengas would be the best option. I have seen few other outfits from Anisha Shetty's couture and her designs spell ethnic fashion with an modern flare. I would like to share few of my favorite picks from her exclusive collection. Her collection is displayed on Vintage Desi, they ship internationally. Please CLICK on the description below the images to go directly to the website to see the price and other details. Well, the one I like the most is the one I wore. So If you wish to check that one, its here ! What a gorgeous ensemble, Anisha! And that necklace reminds me of my mother's wedding set. It's indeed extremely elegant! Wishing you a happy new year too! Gorgeous! I loved your attire! That necklace adds all the more glamour to it! Happy new year dearrr! Wow, so much elegance and gorgeous pieces ! Love them ! Stunning. Happy new year :) Thank you so much for Visiting me. Good day. You look lovely Ananya! 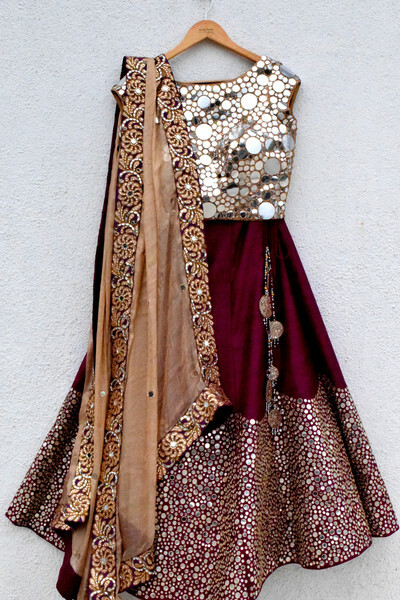 Love the Lehenga! A Very Happy New Year to you. u are such a stunner. Never seen u in Indian wear, so am totally blown. Love the jewellery, so royal. I love the lehenga...and you look lovely in it. You look so beautiful, the pictures really don't do any justice to your whole outfit ! Love the color on you plus the coral and cream combo is one thing that steals the show here.. Love Anisha Shetty's designs..lovely couture! I have my college farewell soon and I have been looking at suits and sarees to wear to the big day, and I really like this collection.